Danny SC Tseng, Syllable Inc.
For 40 years, the Emerging Trends in Real Estate publication has offered a comprehensive forecast on the US and Canadian real estate markets. 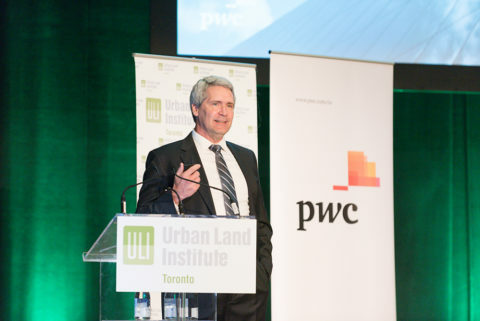 Sponsored jointly by PwC and the Urban Land Institute, the report is renowned as the industry’s most predictive forecast based on insights from over 2,400 personal interviews and survey responses across North America. 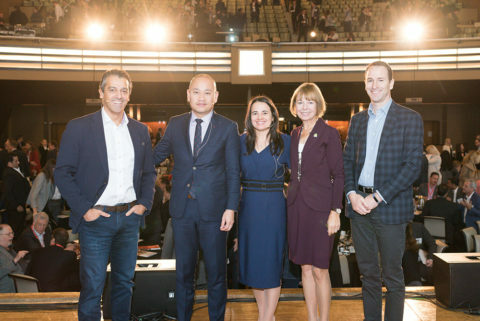 On October 19, 2018, ULI Toronto held a marquee event with a panel of industry leaders who shared their insights on the 2019 report. Reinvent, Rethink, and Rebalance were the three key themes addressed. Andrew Warren, Director of Real Estate Research at PwC, and co-author of the report, delivered a keynote speech highlighting key issues addressed in the forecast. 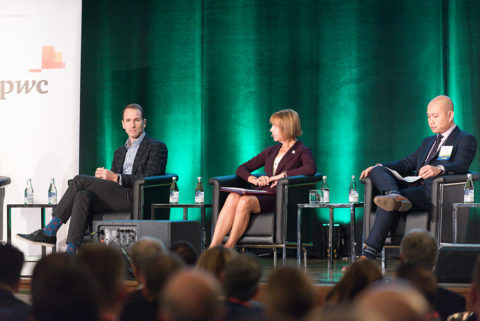 The three major themes were then dissected by a panel consisting of Michael Turner, President at Oxford Properties Group, Cheryl Shindruk, EVP of Land Development at Geranium, Phong Ngo, Director of New Homes Research at Altus Group, and George Carras, Founder and CEO of R-Labs Canada Inc, and moderated by Nadia King, Partner at PwC. A major topic of interest is PropTech (Property Technology). “Think of it as an umbrella term that captures all kinds of innovation taking place at the intersection of real property and technology,” said Carras. 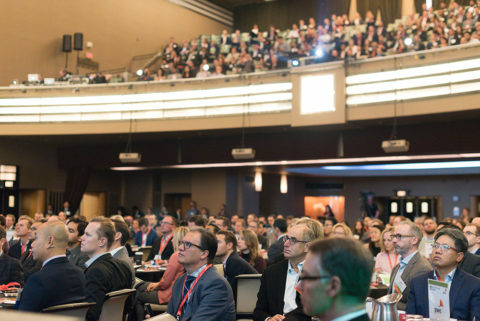 Covering everything from new lending series to investment platforms and digital brokerages, these new market entrants transform how people use real estate and this looks to intensify as tenant behaviours evolve and demographics shift. FinTech (Financial Technology), Smart Real Estate, ConTech (Construction Technology), and the collaborative economy are all interrelated technologies looking to disrupt the real estate industry. Machines are necessary to process the plethora of data being pumped out from the Holy Trinity of technology: the Internet of Things (IoT), AI, and Cloud. “Real estate is operating at a 1.0 world while the world is clearly operating at a 3.0 operating system and we need upgrades in our industry,” said Carras. “5.2 billion dollars have been invested in PropTech…that’s 50% more than last year.” With over 3000 PropTech companies looking to disrupt real estate, the rate of progress outside of our industry is impressive. PropTech is a major emerging trend looking to change the face of the industry, with the potential to change how we invest in, operate, and design real estate. Technologies such as VR (Virtual Reality) and AR (Augmented Reality) are already offering immersive experiences to show pre-construction projects to potential investors, saving time and marketing costs. The arrival of self-driving vehicles is influencing how developers think about parking lots in new residential and office buildings. Technology is also altering the leasing and sales process by offering online tools to help buyers do their own research and negotiate prices before even arriving at the showroom. On the retail side, in order to gain insights and develop strategies that can deliver on shifting needs, landlords are turning to data analytics to determine new rental models, diversify merchandise offerings, create new experiences to attract shoppers, and determine the best use of certain assets in their portfolios. Everyone wants to attract and keep workers. With Labor shortages showing up all over North America, a war for talent has broken out and companies are seeing their space as a way to create employee engagement, boost productivity, and promote health and wellness. Full service cafeterias, showers, and fitness facilities are just some of the amenities tenants are asking for, and although this list is subject to change, the concept of tenant satisfaction will continue to be important. Furthermore, the phenomenon of the gig economy and the sharing economy are continuing to take shape. A growing desire for flexibility and uniqueness has arisen and landlords must adapt. The report noted that this shift is driving a growing portfolio of “real-estate-as-a-service” offerings (ie. Airbnb and WeWork) where organizations are able to take advantage of flexible spaces without long-term obligations. Coworking spaces combine nimble leasing options with features such as networking events, business services, and other amenities, and the effect is an immediate impact on the market. However, others have noted that these spaces don’t have lasting impact because companies eventually grow out of the space and look for a larger, more permanent office. The demand for flexibility and novelty is going to continue and perhaps be further accelerated as more young people enter the workforce. With Millennials making up 50% of the current workforce and rising to 70% in five years’ time, an evolution is on the horizon. “If there’s anything we can rethink, housing and affordability is an extremely complex puzzle,” said Warren. The second of the two major themes deals with addressing affordability. With land costs as the number one development concern heading into 2019, there’s no question that housing affordability is a significant challenge in major Canadian cities. However, the disagreement arises over what to do about it. Warren noted the following steps to solve the crisis: first define the problem, understand that it can’t be solved by getting just one side right. Then move the pieces in coordination while watching out for unintended consequences, and finally, find a way to create the right amount of new supply. Canada does not have a national housing market, rather, each local market is unique with its own issues, challenges, and opportunities. Actions taken so far addressed demand issues but offer little relief on the supply side. Furthermore, the panel questioned the market’s readiness for two huge demographic tsunamis about to cascade over the housing market: first-time buying Millennials forming families and the aging population. “The problem is supply,” asserted Shindruk. “Our region expects to grow to 9.7 million people by 2041 and that’s about 115,000 new residents per year. We are going to need 55,000 housing units to be built on annual basis and we’re barely doing 40,000 a year,” he said. Ngo noted that within the GTA, there’s an estimated need for monthly inventory between 25k to 30k units to maintain a balanced market. “Last time we were at that level was November 2015 and we’re currently at about half of what we need,” said Ngo. King noted that the government favours high rise, but a lot of consumers want low rise. “Low-rise inventory, when the Growth Plan was introduced years ago at that time was around 16,000 units. Now, we’re just at 4,700 units of inventory on the low-rise side and over 45% within that are priced at a average of $1 million with less than 10% of the units priced under $700,000,” said Ngo. With high demand and limited supply as the main forces at play, government development charges also factor into cost of homeownership. Warren noted that the average government charge for a single-detached home is nearly 22% of the price of an average new home, doubling over a short period of time and the cost is anticipated to rise more. Adding in interest rate hikes and tougher qualifications rules, it’s becoming more challenging on the high-rise side as well. “Right now it’s 18 percent to 22 percent of what it would cost a developer to build a typical condo in GTA and costs have risen by 138% since July 2013. It will increase again in 2019 and further in 2020 so that’s going to continue to put upward pressure on average condo prices, which since 2016 have increased year-over-year as high as 40%,” said Ngo. The average condo cost is pushing close to $800,000 and that’s supposed to be the more affordable offering. On top of the development charges, Warren noted a common refrain across Canada is the difficulty of dealing with municipal bureaucracy to get new supply on the market in a timely manner. Municipal red tape slows supply and there is a need to ease zoning restrictions. Plan examiners also need to be held accountable to timelines to avoid further delays. Until we become better at addressing supply issues, whether it be through improving the approvals process for developers to get projects to market quicker or providing relief on charges, affordability will continue to erode for many buyers. “The shortage of affordable housing we’re experiencing really does have an impact on our competitiveness and our ability to attract people and businesses,” said Shindruk. “It’s even more challenging when trying to hire people from outside the GTA. Alarmingly, more and more folks are looking for relocation allowances for housing and even hotel allowances for instances where they don’t want to do the commute on a daily basis.” The report noted over and over again that successful cities do have an ample supply of affordable housing so it’s not surprising the Toronto Region Board of Trade and Ontario Chamber of Commerce are begging for more housing. “The most innovative cities are the most expensive, such as San Francisco, London, and NYC,” said Carras. “There’s lessons to be learned in scarcity.” Turner drew an example in New York about ways the city has used property tax policy and tools to incentivize the marketplace to deliver an affordable component. “We have to find a way to collaborate with government to create conditions to incent the market to deliver supply,” said Turner. Part of the solution to the affordability puzzle is in rethinking how to get the government to ease approvals processes and solving the labour shortage. “We need to cut the red tape and look at ways to streamline every possible process,” said Shindruk. “We need to instill a culture of excellence and a commitment to delivering more housing in the region and expedite the approval and review process.” Government tax charges and fees on housing needs to be tackled because it all ends up in the prices of homes. The skills gap in the building and construction section also needs to be part of the strategy due to the shortage of blue-collar construction trades. Rebalance is the last of the three major thematic trends for 2019. Investors are seeking to optimize portfolios to produce stronger yields and seeking strategic partnerships and joint ventures to mitigate risks. Warren noted that smaller, non-typical gateway cities have been enjoying significant growth. This is possibly a result of the issues around affordability with development money now being redirected to smaller cities with less red tape, lower taxes,, and big markets. In regards to external forces such as tariffs, construction costs have been rising steadily, which will likely produce an upward jolt from escalating international trade wars. Unlocking data possibilities and insights through technology will become an asset when it comes to deciding the next investment move. Predictive modelling can help portfolio managers calculate the next markets to move into and decide where opportunities lie in each asset class. “Currently, less than 10% of the data collected is being utilized and we’re only at the precipice of where information is at,” said Warren. The challenge is knowing which applications and data to focus on. However, the industry is starting to see a maturity in the use of data. In fact, data and predictive analytics have already started impacting businesses. “We’ll see it playing a greater role and focus going forward and giving clients access to sophisticated uses like indexing and modelling,” said Ngo. Turner and King both noted that Oxford and PwC are already using predictive analytics as well in daily operations and the challenge is the skillset required to use and leverage data. This is where having good data governance is important. People with good tools and analytical skills able to manage large amounts of data will start becoming important part of teams moving forward.